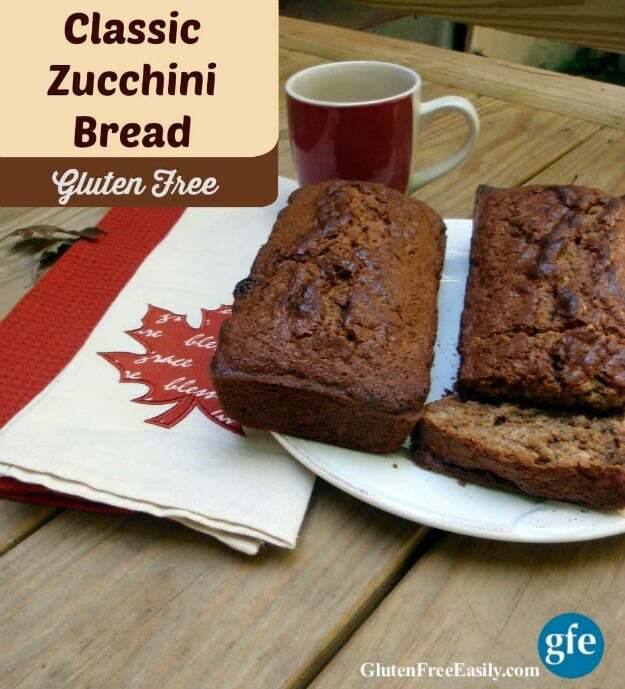 Many of you are familiar with my gluten-free Chocolate Zucchini Bread, but today I’m sharing the recipe on which that was based—my gluten-free Zucchini Bread, which is a classic quick bread. I know it’s hard to believe, but sometimes you don’t want chocolate. Well, let me re-phrase that … I always want chocolate, but sometimes I enjoy other flavor combinations as well. This gluten-free Zucchini Bread is a lovely quick bread with a cup of tea in the morning or when that afternoon “I must eat something sweet now” moment hits. The kiddos won’t mind if you pack a slice in their lunches either. Two more mentions before you go … I often freeze several ziploc packages of shredded zucchini just so I can continue to make this recipe well into the fall and even through mid-winter some years. All you do is shred your zucchini and place it in a ziploc bag (removing all the air per usual) or another freezer-safe container. When you’re ready to use it, simply thaw and drain and add to your recipe. It’s that easy! I’m linking this recipe to the new blog carnival event, Gluten-Free Recipe Fix, that I’m co-hosting with two of my blogger friends, Cassidy of Cassidy’s Craveable Creations and the event’s founder Linda of Gluten-Free Homemaker. The event kicks off with the Back to School and Fall Recipes edition here. I hope you’ll check it out! A classic cinnamon-y gluten-free quick bread that makes fine use of summer's favorite green squash. In a large mixing bowl, beat eggs, oil, sugar, and vanilla. Bake at 350F for one hour or until bread tests done via the toothpick method. Let cool for 10 minutes or so. Remove from pan. I like to use oils like extra virgin olive oil and coconut oil (even expeller-expressed coconut oil if you don’t like coconut flavor), or a combination of oils. You can even substitute unsweetened applesauce for part of the oil. I wouldn’t recommend using a lot of applesauce though. Despite its reputation for making baked goods moist, I think the addition of applesauce makes this bread just a little bit drier than if all oil were used. Although it’s easy to buy zucchini and leave it on your counter a few days, it’s best to use it right away to take maximum advantage of its wonderful moisture factor. Even zucchini a few days old will be much drier. I've made this bread with and without xanthan gum. I haven't seen a big difference in the results. Originally posted September 16, 2015; updated August 5, 2018. Yes, I still have on or two zucchinis in my garden. Time to turn on the oven and try your recipe. I’m looking forward to trying coconut sugar. This will be a first. Thanks. 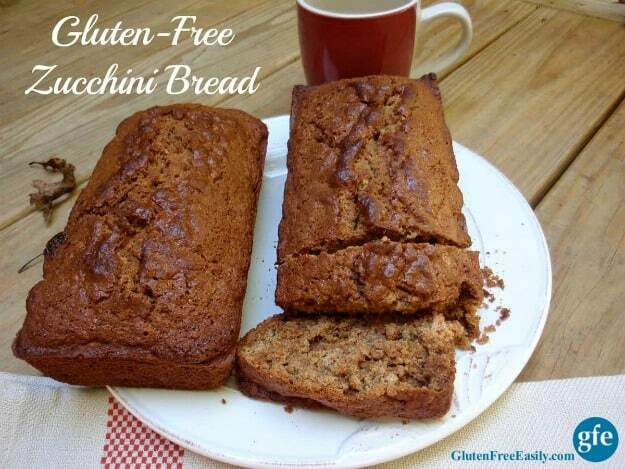 I love a good, gluten free bread, and this zucchini bread looks great! Hi Shirley – just pulled 2 loaves out of the oven and they smell yummy! Used a box of King Alfred flour I needed to use up, plus a whopper zucchini from the garden. Hi Kerry–It’s great to see you here again at gfe! 🙂 I sure hope this recipe met with your approval after you sampled one loaf! Hope you’re having a good week. Thanks so much for taking the time to comment! Oh, I should also mention that I sub’d melted butter for the oil. After seeing your link to this recipe on FB recently, I had to make some! I haven’t had zucchini bread in years, probably, and it’s great! Mine turned out a little chewy on the outside, but I may have overbaked it slightly. It’s still really good! Thanks for sharing the recipe! Hi Kristen–Good to see you here at gfe again! 🙂 I’m so glad this bread was a success for you! I do love a bread that has a little crust/chewiness on the outer edge, but I don’t remember this one particularly having that feature. So, yes, bake a little less time next time and see how that goes. So glad you are enjoying it and I really appreciate you taking the time to leave a comment here! Can I reduce the sugar content in your recipe? I made a zucchini bread recently (another recipe) and found it far too sweet! I am gluten & dairy free normally but due to breastfeeding, have started omitting as much sugar as possible. Hi Laura–Welcome to gfe! 🙂 I’ve not tried this with less sugar, but I’ve always read that you can start out reducing the sugar in a recipe by about 1/3 cup. I can only suggest giving it a try and seeing how it goes. Then if that works, you could try reducing the sugar even more. If you’re a coconut sugar fan, that is a non-refined sugar that tastes less sweet. If you’re interested, you might be able to use less sweetener and use coconut sugar as your sweetener. Hope that helps a bit. Please let us know how it works out.